My husband and I love to take the scenic route when we travel and discover quaint small towns with Main streets lined with shops to explore. I recently discovered that one in my own back yard just 20 minutes from my home has blossomed into a wonderful place to wander and enjoy. Medina is on Route 31 between Rochester and Buffalo in Western New York. Great Shop Hop Adventure June 7th – 10th 2017. 13 shops around Western NY. Receive a spool of thread from each shop! 25% off all bolted fabric. Hoppers can also enter to win a Janome 2030DC, $75 gift certificates, $25 gift certificates and more. Row by Row Experience starting June 21, 2017. Beginning June 21, 2017, visit any of the participating shops and receive a free pattern for a row in a quilt. Combine your rows in any way to create a unique quilt that represents the fun you had traveling to the stores. Create a quilt using at least 8 different 2017 rows from 8 different 2017 participating RxR shops and be the first to bring it into a participating shop to win a stack of 25 fat quarters (6-1/4 yards of fabric!). Use that shop’s row in your quilt and win a bonus prize! Here is a list of some of my favorite shops. 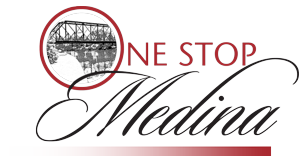 Click here to link to the Medina website where you can find more. Be sure to check the events calendar. Many of the shops have a wonderful map showing all the shops and a little info. about each. A Knitter’s Corner is very small but cozy with a table in the center for customers to just sit and knit or crochet together. The English Rose Tea Shoppe the name says it all – a lovely Victorian setting with teas, cookies, jams, and more. Della’s Chocolates creates my favorite sugar free dark chocolates along with a large variety of other handmade goodies. The Bread Basket features different specialty baked items each day of the week. Just walk in the smell of fresh baking will capture you. Blue Gill Trading Post is only open Thurs., Fri., Sat. from 10-5 and so much fun to hunt for treasures. ellen j. goods refurbishes vintage things to make them new again and offers paints and workshops to make your own unique creations. 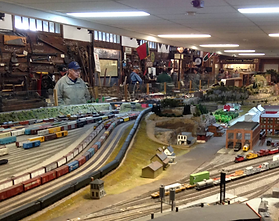 And don’t miss the Medina Railroad Museum where you can drop off the guys while you shop or stay and enjoy it together. My whole family loved it! Me ha gustado mucho la noticia, ciertamente sobresaliente, gracias por la aclaración, demasiado ilustrativa. Me quedo investigando por la web a leer mas cosas aclarativas, muchas gracias nuevamente. “Balls…licking..okay…who..who..who licks…?””Who is this?!””Dan. This is Dan Harmon.”I love you guys.